We went to a flea market yesterday and I had such a fun time looking through maps, postcards and of course books. I always try to visit a flea market when I’m in Germany because I’m always on the lookout for vintage items I can use in my journaling or other crafty pursuits. In the past I’ve bought stamps and postcards but this time I think I really hit a treasure trove as I found these gorgeous old books. Aren’t they lovely? The blue and gray books have very simple but nice covers. Their spines are what make them stand out as they’ve got some lovely inlay designs. But I especially like the books with the illustrations on the covers. I don’t think I’ve really seen books like these before. 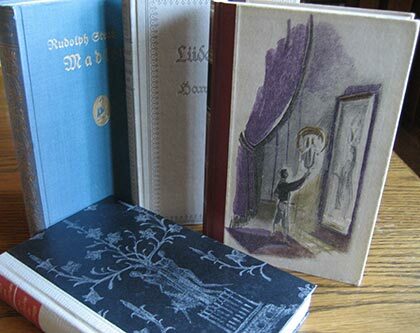 My first thought was that I wanted to use these for altered book projects but they really are in pretty good condition and with a bit of restoration they could look wonderful. Problem is, I know very little about book restoration. Hmm, I guess I’ll have to think on it and see what I end up doing with them. Anyway, I must get going now because we are off to Braunschweig today to visit one of my favorite bookshops (Graff), have some currywurst and spend an evening with a good friend. I’m sitting here drooling (not a pretty sight!). Not only are those particular books beautiful but the whole shop looks superb. 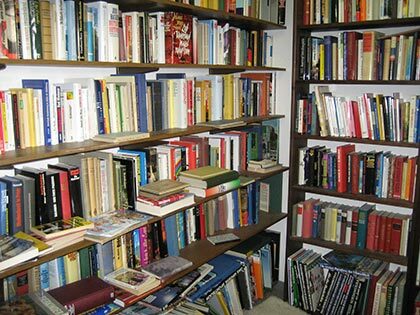 I feel a visit to my friend Anna, who runs a bookshop that sells both new and secondhand books, coming on. If I go quickly before my bank manager gets wind of it I might even be buying a whole load of books. Get thee behind me Satan! How cool! I can hear your wheels spinning, wondering where you can take a class in book restoration! So is Braunschweig where braunschweiger originated? My grandmother (who was German) fed it to us constantly! Wow, those books are gorgeous! I hope you restore them. I think that would be wonderful. Have a great time. Wow, those are beautiful! I do love the illustration. Have fun! Those are nice books! I always loved doing altered projects, but altered books made me feel the tiniest bit guilty! 🙂 It somehow seemed contrary to what I should be using the book for. Have fun in Braunschweig! Definitely some great finds there. Alteration of them would be a cool thing to do!!! I would love to go to a flea market in Germany!! Table Talk – You must run to your friend’s bookshop! 🙂 Of course you’ll have to let us know if you find some goodies! I love the treasures that you can stumble upon at a used bookshop. 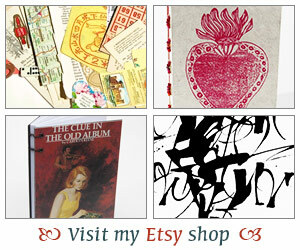 Sandy – If I still lived in Dallas I could go to the Craft Guild and study with my bookbinding teacher. Maybe I’ll have to get in touch with him and see if I can do a little workshop one weekend or something. At least to get some basic questions answered! I don’t know what Braunschweiger is… I asked my husband and he’s never heard of it but it makes sense to me that it would be from that region! Serena (Savvy Verse & Wit) – They are pretty aren’t they? And, really they don’t need much work to fix them up. It’s mainly just cleaning I think. So we’ll see what I end up doing with them! Andi – They are so pretty. I am actually a bit surprised there aren’t more illustrations inside or at least I haven’t found any yet! Danielle – I know what you mean! I don’t mind altering a book if it’s some mass produced sort of thing but something like these which may be a bit more hard to find it certainly makes you think twice! Staci – There are some great flea markets around. Just yesterday as we were driving to Braunschweig we saw a sign for another in a nearby town but we couldn’t go. Ah, well another time! What a wonderful find! Won’t it be fun to learn a new skill that you can put to good use restoring these … you never know where it might lead you! I just read your next post, about the stop in Iceland … you’re having a great journey … enjoy! The one of the man in front of the picture, is that The Picture of Dorian Gray by chance? Nice finds!